Members of the Congressional Progressive Caucus convened a hearing in Washington, D.C., on Tuesday to add another dimension to the the ongoing debate around unaccompanied children from Central America arriving in large numbers at our southern border. Three children, who were once unaccompanied minors from Honduras, Guatemala, and El Salvador, testified to the violence they experienced which hastened their journeys to the U.S.
Mayeli Hernandez, 12, also spoke of the cold detention centers. 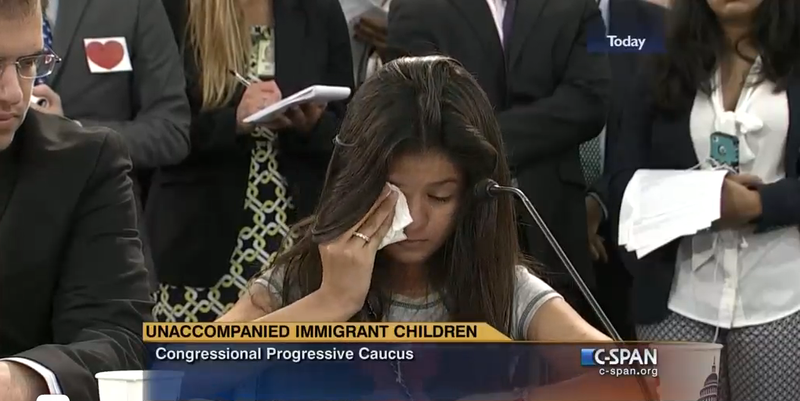 Her long dark hair almost hid her face as she quietly read her testimony in Spanish. She rubbed tears from her eyes while describing her loneliness after her mother left Honduras for the United States when Mayeli was 8. Mayeli and her younger sister left Honduras in July 2013 because they were afraid of the violence and because her younger sister suffered from epilepsy. Before she fled, Mayeli said she saw two people slain in Honduras. “It was very ugly to see the blood running on the ground,” she said. “I have seen horrors that no child ought to see,” he said, looking toward the members of Congress. MS-13 gang members threatened to kill him if he rode his bicycle through their neighborhood. He was afraid if he stayed in El Salvador, he would be asked to join a gang or be killed. He said he was very weak after spending six days there, because he wasn’t given enough food, was always cold and couldn’t sleep because guards came in every two hours, counting the children. There was only one bathroom for all 200 occupants. The “ice boxes” that Martinez referenced, also known as “hieleras” have come under increasing scrutiny as more individuals have come forward with stories of their detentions in freezing rooms with no proper clothes or blankets to protect them from the cold. It is impossible to listen to the real life stories of these children without wondering why the debate has turned so ugly. If members of Congress were to take the lessons of this hearing to heart, they would ensure that these children are properly cared for, receive a fair hearing, and have a chance at a better life. At a minimum, such stories should shift the focus away from viewing this influx at the border as an immigration enforcement crisis, and towards an emergency response in which compassion is the dominant theme.